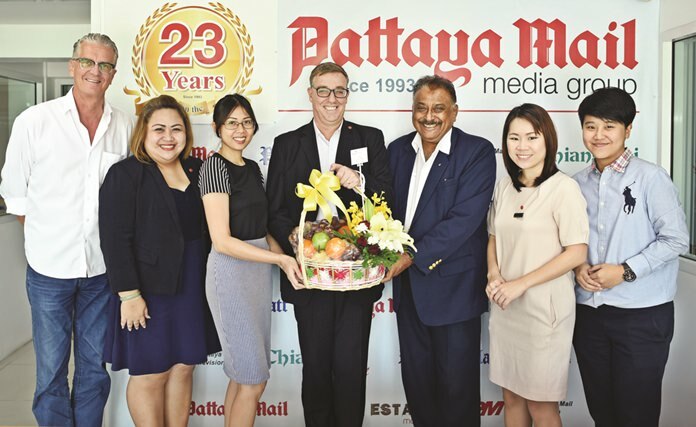 It was a Happy Day at the Pattaya Mail as a small group of family and friends gathered to celebrate our 23rd anniversary. 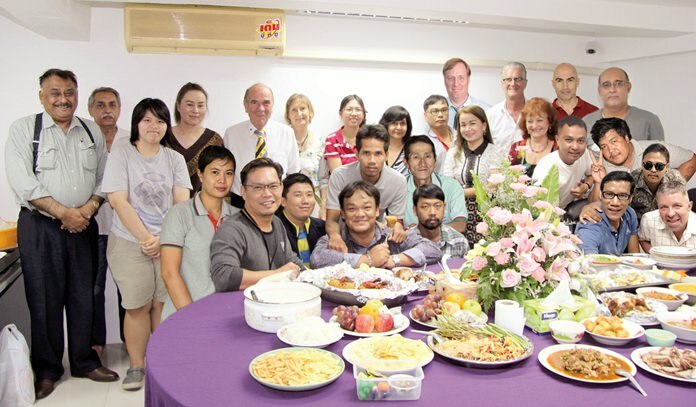 The Pattaya Mail family gather for a magical 23rd anniversary celebration. As if lifting a page from the Brothers Grimm fairy tale, our team installed a magic table in our office. We covered it with a huge table cloth and as Sue and Meow uttered the words “Table Deck Yourself” the table covered itself with the finest food from many parts of the world. Thai-Isan cuisine included Gai Cho, Somtum Thai, Nam Tok Moo, Nua Moo Yang-Chim, Larb Moo and Khao Niew, all supplied by Mae Taeng on Thepprasit Road. ‘Table deck yourself’ commanded Maliwan Pengpitak (Meow) and Supa Kukarja (Sue). Delicious Indian specialties supplied by Ali Baba included Dal, Rogan Josh, Aloo Gobi (my favourite), Butter Chicken, Palak Paneer, Raita and the irresistible Garlic Nan (Yummy). Last but not least, without which no party is ever complete…the scrumptious pizzas by Pan Pan. An assortment of fruits and sweets brought the memorable afternoon to a close. “What about drinks?” you may ask. We drank plenty of water, juices, coffee and tea. Richard Gamlin (centre) Resident Manager of Amari Pattaya and his team came by to wish us a Happy Birthday. Manatchart Pai-anan (Pop) Public Relations Executive brought us good wishes from the management of the A-One Hotel. Wanitchaya Kietdamrongwong ‘Ying’ (3rd left) Manager of Hotel Baracuda together with Sattaya Kotemaitree ‘Tor’ (2nd left) MarCom Executive and Nitchamon Netsung MarCom Executive of Mercure Pattaya Hotel brought gifts and good wishes. 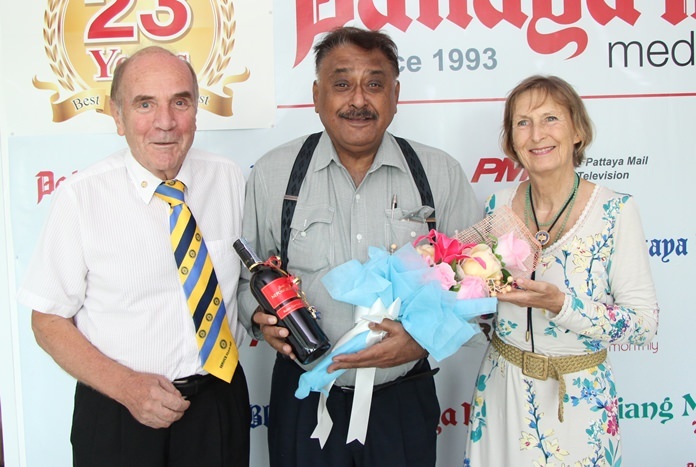 Dr. Otmar and Margret Deter, President and secretary of the Rotary Club of Dolphin Pattaya International present Peter with a rare bottle of Austrian wine. 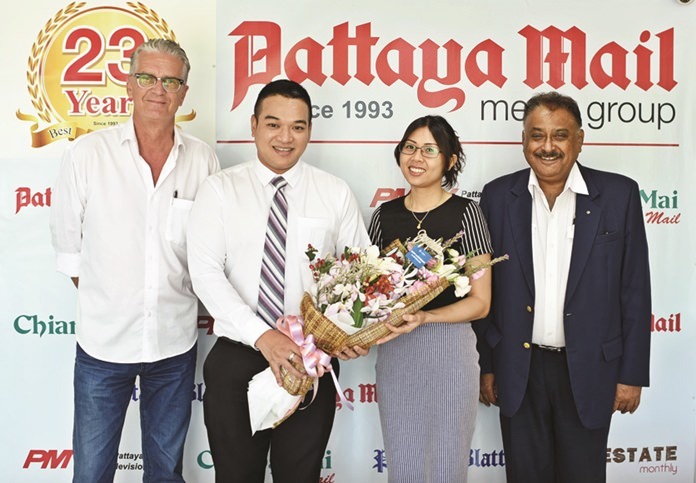 Parapa Teerasoontornkul ‘Por’ MarCom Manager and her team from the Hilton Pattaya present a gift to Nutsara Duangsri, Deputy Sales and Marketing Manager of Pattaya Mail. 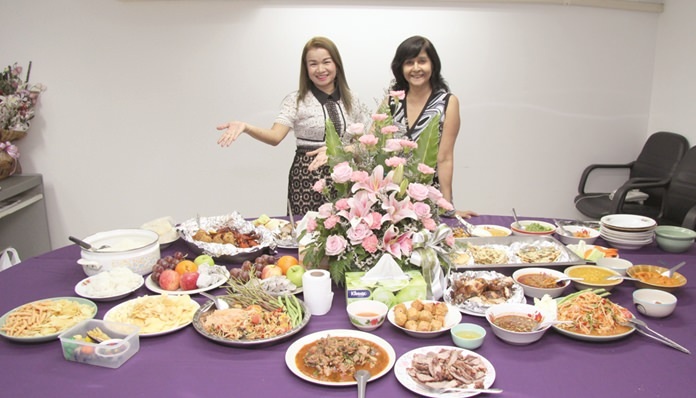 Sasima Panichvibool ‘Love’ Group PR and Marketing Manager of Sunshine Hotels & Resorts represented the Supornsahatrangsi family in wishing us continued success for many years to come. 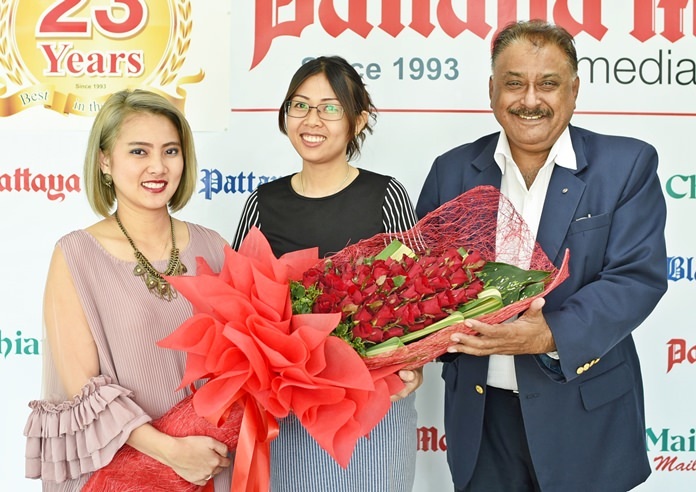 Thanagon Poungbubpchart ‘Pete’ PR & MarCom Manager of Holiday Inn presents a beautiful bouquet to Nutsara of Pattaya Mail. At left is Jo Klemm, International Marketing of GO Property Thailand. (L to R) Sue Kakarja, Jo Klemm, Dr Otmar Deter, Elfi Seitz, Dr. Margret Deter, Malee Malhotra, Victor Wong, Marlowe Malhotra and Peter Malhotra pose for a commemorative 23rd Anniversary photo.